As I blogged before, NLB very kindly put me in the subscription list for BiblioAsia, their "news journal to promote collection services and programmes of the new National Library". This is frankly misleading and an understatement as it carries very good and scholarly articles on history and heritage. They have it up online. With no complimentary BiblioAsia in my letterbox for months, I thought they had struck me off the list during their annual review, so I did myself a favour by self-servicing a copy off their shelf when I went to the National Library for the street exhibition open house. I was too impatient. Days later, but after Chinese New Year, I noticed a thick magazine plastic cover on my home table containing ...*gasp* ... five copies of BiblioAsia! 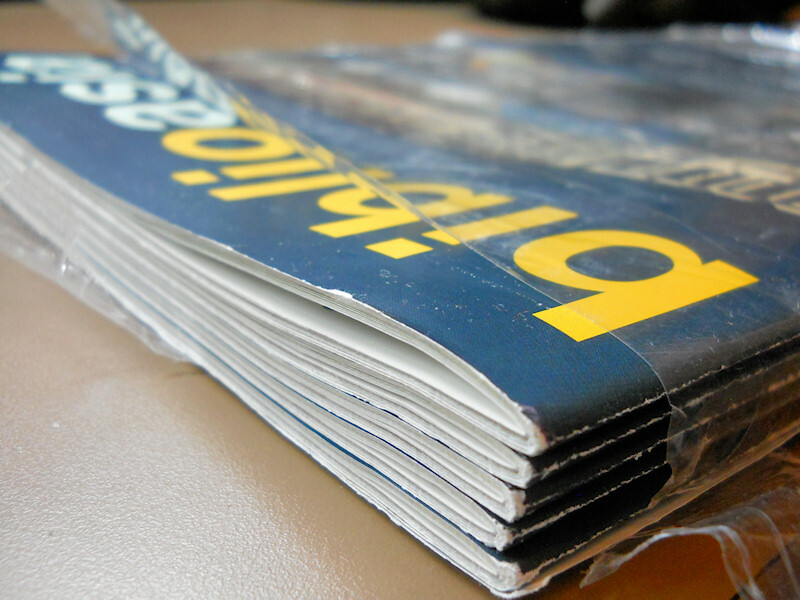 By then I had finished reading the latest issue obtained from the National Library. The five copies came belatedly by post. 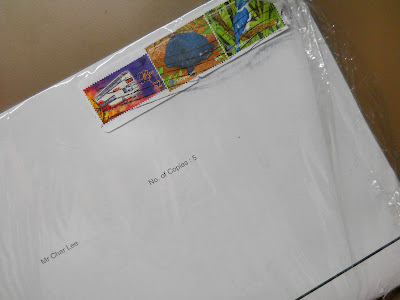 5 copies were sent to "Mr Char Lee" (I removed the address). Total postage: $2.55. There was no mistake, not that somebody (the packer, if there is such a term) accidentally slipped five copies into the plastic cover. I looked closely above my name and address and there it was written, "No. of Copies: 5". Why did they send five copies to me; was it meant as a big ang pow? On a more insidious note, how did they know the number of people in my household? They were not spot-on, but thanks anyway. I examined the stamps with interest: the $2 SBS Super Bus service 7, the 50 cents Black Marsh Terrapin, and the 5 cents White-Collared Kingfisher. The last two are low value definitive stamps for the ‘Pond Life’ series (see this). The postage costs $2.55 which I thought was a heavy sum for an issue of BiblioAsia. If they only sent one copy instead of five, the postage could have been only 50 cents (my guess, I do not keep the plastic covers from previous issues). In that case, they could have given me a $2 ang pow to substitute for the extra four copies! Nothing. Still lying on my table.